EVERTON’S GOODISON PARK is one of football’s ancient homes. It has played host to some fine games, including memorable scenes in the 1966 World Cup. Furthermore, it has hosted more top flight football than any other ground in England. But over the past few days, there are signs that the club may, at last, be on the move. It won’t be for a few years, but the project that has seen as many hurdles as Aintree may have a happy conclusion after all. Over the past 20 years, as new grounds have sprung up and the commercial opportunism of the game has taken root, clubs like Everton and Liverpool look like they have been missing out on something. There have been something like 30 new Football League grounds since 1988 when Scunthorpe United opened Glandford Park. Both Everton and Liverpool are cast in the old fashioned model, surrounded by Victorian housing, difficult to expand and in need of regeneration. While they were once both shrines to industrial football, they now seem outdated, restricted and representative of a bygone age, like the church in the corner of the ground. Everton have been trying to come up with an appropriate scheme for the past 20 years. Many football fans are usually opposed to moves from ancestral homes, but as long ago as 1997, Everton’s followers were backing relocation. In 1997, for example, a poll of fans revealed that 83% wanted a new stadium away from Goodison. But there have been many plans, aborted projects, local politics and planning issues. There’s been a few grand plans: the King’s Dock scheme, the proposal for a ground share with Liverpool; the Kirkby project; and the recently abandoned Walton Lane development. Anderson said this week that Everton have the money to build a new stadium. This comes just a few months after Farhad Moshiri, the Monaco-based Iranian businessman, had bought a 49% holding in the club. Everton have been looking at two new potential sites – Stonebridge Cross off the East Lancs Road and a disused area on the north Liverpool dockland. 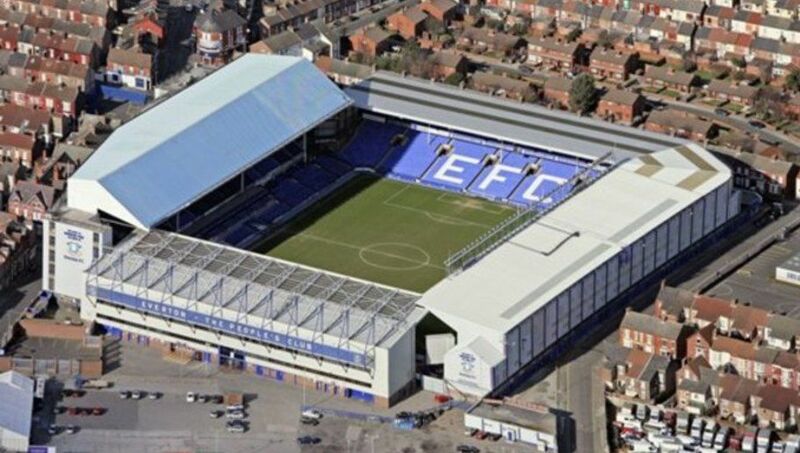 Everton’s fans want the new ground to be built on the latter rather than an out-of-town plot in Croxteth. The stumbling block could be the owners of Liverpool Waters, where the favoured site would be. The company has plans of its own, including tall residential towers and offices. So far, a stadium does not figure. It’s easy to see why a football ground might not feature in such a scheme. Peel Group describes its vision for the Mersey Waters Enterprise Zone as one of the city’s most important regeneration and investment opportunities, and one of the largest single ownership port-city development schemes in Europe. But with Everton’s new found wealth – Moshiri said at the outset that the stadium was a priority – fans are hoping that the Peel Group can be persuaded to sell part of the 60-hectare stretch land.